Kid Rock is supposed to receive an award at Detroit's upcoming NAACP gala, but some people don't think he should. Some supporters of the civil rights organization are boycotting the annual fundraiser on May 1 because the rocker, who is supposed to receive the branch's Great Expectations award, holds up the confederate flag in some of his performances, The Detroit News reports. "It's a slap in the face for anyone who fought for civil rights in this country," political consultant and head of Detroiters for Progress Adolph Mongo told The Detroit News. "It's a symbol of hatred and bigotry." 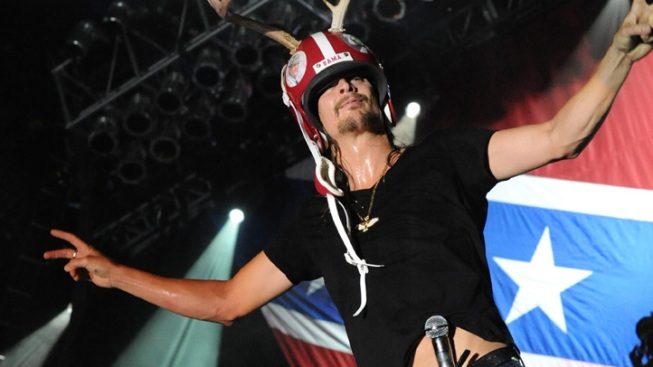 Kid Rock, on the other hand, has his own interpretation of the banner. In a Guardian interview in 2008, the rap-rocker defended waving the Confederate flag in his concerts. "Sure, it's definitely got some scars, but I've never had an issue with it," he said. "To me it just represents pride in southern rock'n'roll music, plus it just looks cool." NAACP defended honoring Kid Rock, who got his start performing in talent shows in the Detroit area. "[Kid Rock] has consistently lifted up the Great Expectations of many persons… concerning the future of the city" Donnell R. White, interim executive direction of the NAACP Detroit branch, said in a statement. About 10,000 people are expected to attend the annual dinner.